Description: Hump set with broom. Description: CSX 2463 on a snowy day mated with a matching ex-CR MT6. Frontier Yard, ex-CR nee-NYC. 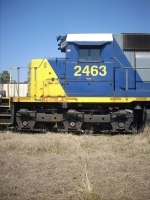 Description: Former Conrail hump set now wears CSX's YN2 paint. 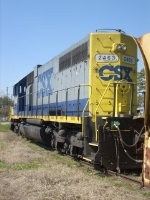 CSX SD38 and MT6. Description: Mother and slug unit pushing a train over the hump at Selkirk. Description: X-CR yard loco far from home. Description: Unfortunately the 38 was shut down when I stopped by. Description: The crew of M772 have just bailed off for their lunch break. Photo taken from the Bridge Ave. overpass. Description: Six axle power is rare on locals in Tennessee, so I was lucky to catch this SD38 at the depot in Murfreesboro. Photo taken from the Bridge Ave. overpass. Description: Looking north past the former N.C.&St.L. depot at Murfreesboro. Description: CP 6045 with the "Pac-Man" logo leads eastbound X500 to Detroit with a CP AC4400CW and a CSX SD38 trailing. He is crawling past the station because Q326 is shortly ahead of him. 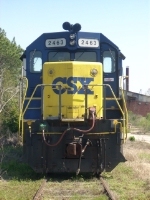 Description: One of the very few CSX SD38s trails on CP X500 to Detroit.